SA would never have thought that a debutante player would be savior for them and would make century to turn their visible defeat into a moral victory in the shape of draw. Had JP Duminy not got hurt, du Plessis would not have been in this Test. It was a huge task for SA to chase a target of 414 and to bat for four and a half sessions.However, du Plessis heroic saved them as he scored unbeaten 110 runs from 376 balls. 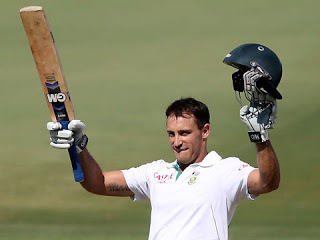 SA were all praise for du Plessis who made this huge task possible by not only batting for so long but also wearing down Australian bowlers and exhausting them. However, he was supported early on by AB de Villiers. He played against his natural style to score 33 runs from 220 balls without hitting a boundary. He was happy with the defending style as that was the need of the hour. Jacques Kallis scored 46 runs from 110 balls despite his hamstring. Australia had a chance to win the match a lead the series 1-0, but the opportunity was missed due to some missed chances, may be called bad luck. The chances came in the over of Clarke against du Plessis was given out but batsman’s review took away those chances. As far as Australian bowlers were concerned, they couldn’t have done more. Even in the final over after bowling 33 overs, Siddle’s pace didn’t drop as Australian victory was still possible at that time had they got out the tail enders. However, Siddle’s attack was well defended by Morkel which left South Africa on 8 for 248 when stumps were called. Siddle finished with 4 for 65 from 33 overes. An important thing to note that was the fact that du Plessis did not get carried away by the situation. He had the goal of team survival rather than his own heroic. Even after scoring the century, he acknowledged the applause and then settled straight back down to continue his job. It was for the first time since 1921 that two consecutive tests between Australia and South Africa resulted in draws. Now the winner of the series will be decided in Perth.